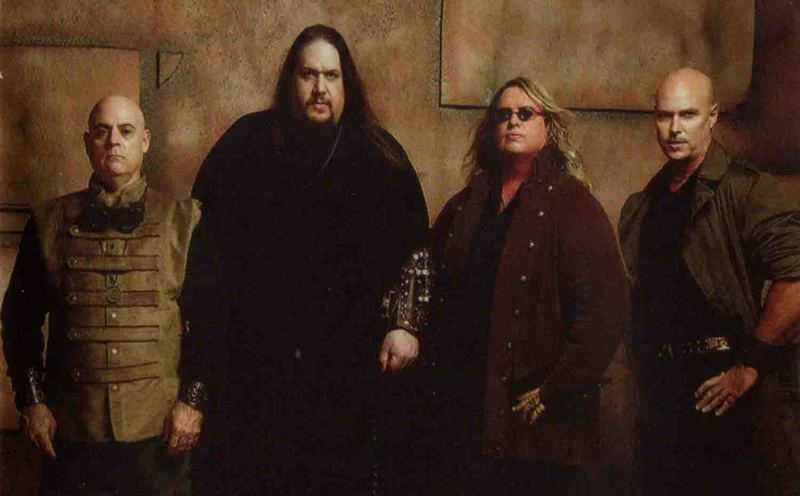 The Original Pioneers of Steam-Prog, melding the imagination of progressive rock and steampunk with the pure power of CLASSIC METAL.OUR OWN DEVICES is the first full length debut album from Florida-based progressive metallers MINDCAGE.Mixed and pre-mastered by rock legend Michael Wagener (METALLICA, OZZY OSBOURNE, SKID ROW, DOKKEN, RAVEN, MEGADETH), OUR OWN DEVICES is a fantasy storybook set to music. Combining cultural and literary elements of steampunk, dystopian society and futuristic technologies with highly articulate progressive metal music, the album transports the listener to a world broken and needing a hero. That oppressive world is devoid of arts, creativity, light, and ultimately, humanity. But from it springs an enigmatic character, Arabella Vash, who is called to The One Constant, a group of rebels who maintain the history and teachings of the last free society.The core members of MINDCAGE — Dietrick Hardwick (guitar), Brian Howell (bass) and Craig Nudo (drums) — have been connected personally and through music for almost thirty years. The significance of this project, for them, is that a lifelong goal has come to fruition. 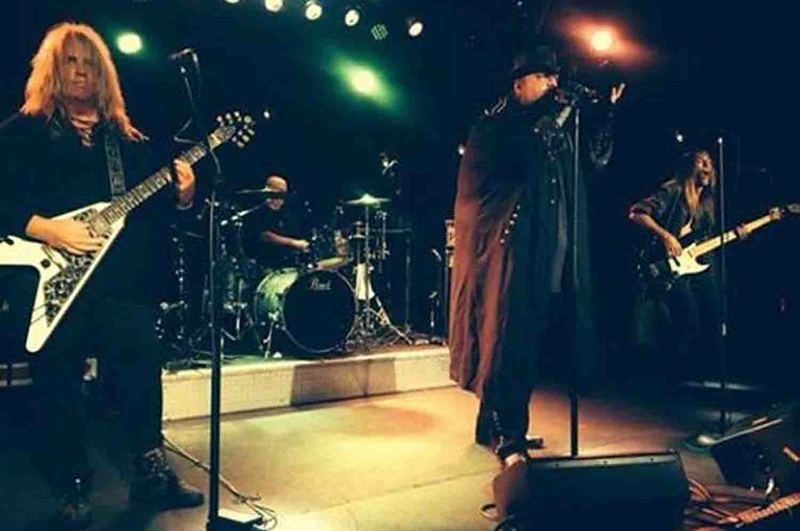 With the addition of power vocalist Jeff Hignite, the intense and unique synergy of writing and performing became apparent. 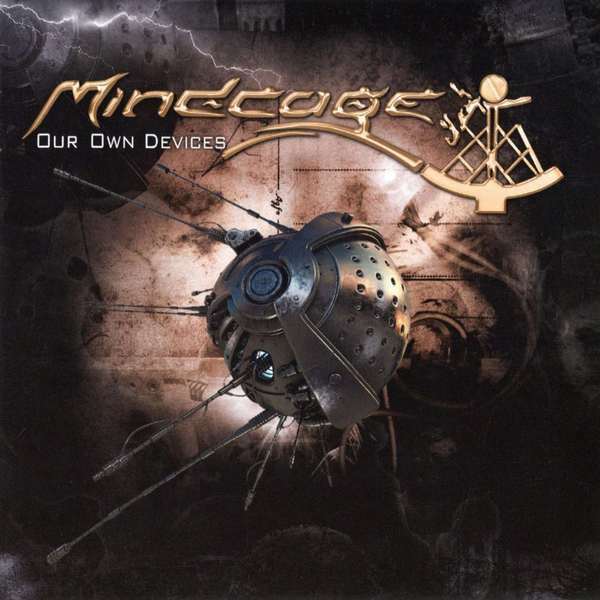 MINDCAGE is a Heavy / Power / Classic / Progressive Metal band from Gulf Breeze, Florida in United States. Band was formed in 1996 and have released their debut album „Our Own Devices” in 2013. Guys have chosen Julie Westlake (Hydrogyn) as the voice of Arabella Vash. The album was mixed and pre-mastered by rock legend Michael Wagener (METALLICA, OZZY OSBOURNE, SKID ROW, DOKKEN, RAVEN, MEGADETH).My favourite track is “The Human Race” with fine sounding keys, massive guitars, and big dozen of melody. It’s great progressive music and a perfect duet with strong vocals of male vocalist with female singer – it is wonderful! Also are hear able some classic music echoes in the guitars. Jeff Hignite has an interesting sounding voice, clear, deep, strong, pure and melodic; he shows emotions through singing. Massive riffs, progressive rhythmic in “For All Mankind (The Dark Design)” absorbs the listener completely. Also in the vocals, I hear IRON MAIDEN, PRIME TIME, QUEENSRYCHE & JORN echoes. Amazing guitar solo is in this song played by Dietrick Hardwick has similarity to MICHAEL SCHENKER or AXEL RUDI PELL.“The Serenity Sequence (Renaissance Pt. I)” and “The Grand Restoration (Renaissance Pt. II)” are brilliant on this CD. In the first of them acoustic guitar is mixing with deep vocal of the male singer & sweet voice of the female singer. It is a fine ballad with IRON MAIDEN echoes and higher climate like in HELLOWEEN songs. The second of them has heavier riffs & a powerful duet of the male and female vocalists. Perfect riffs add flavour to this track. This is just a high level song with DREAM THEATER influences. It is hear able also in the faster “Arabella’s Arc” with melodic progressive riffs and depth of singing.Worth a listen are also: “The One Constant” with JUDAS PRIEST memories and a nice connection to classic music, and the title track “Our Own Devices”, where calmer sounds mix changeable rate, clear and pure singing with impressive guitar solo. There are stronger sounds in “Firefly” with a high style of catchy refrain. 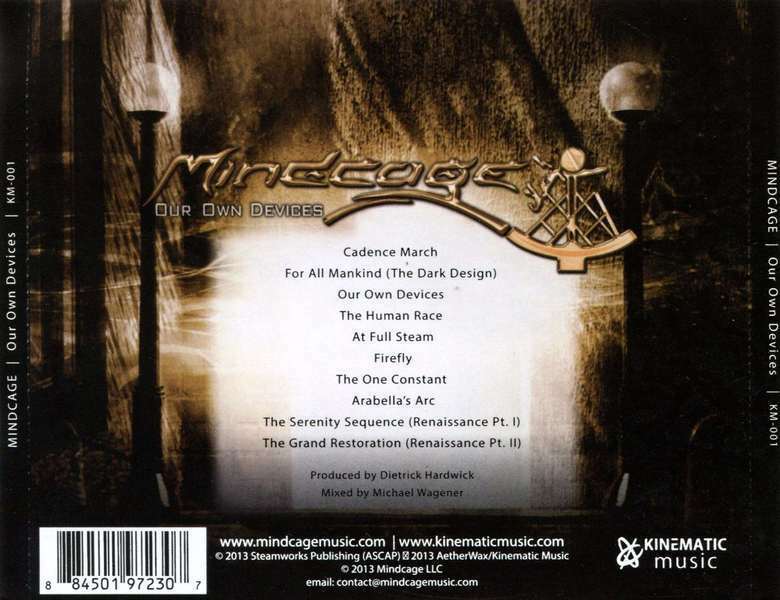 For me every song on this CD is interesting and has its own soul.This album from MINDCAGE is highly recommend for every Metal head who loves Progressive / Power Metal, and such bands as DREAM THETER, QUEENSRYCHE, JUDAS PRIEST or IRON MAIDEN. Generally, the songs are well-worked with melody, power, energy, a passion of playing music.Perfection and experience in every inch. You will be not disappointed after listening to this album of these Florida-based Progressive Metallers. You will just fall in love with their sounds! This music just addicted and hypnotizing.